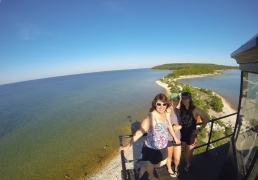 You don't want to miss the views of Hiawatha National Forest, The Mackinac Bridge, Mackinac Island, The Grand Hotel, the Straits of Mackinac, and Bois Blanc from the top platform of the lighthouse! ~UPDATE~ - In 2014, Round Island Lighthouse turns 119, and the 8th Annual "Round Island Lighthouse Open House" is scheduled for July 12, 2014, from 10AM to 4PM EST. In 2013, we took over a dozen groups, and the lighthouse hosted 200+ visitors. GTKT will be leading tours all day. Kayakers should be comfortable paddling in deeper water with potentially larger waves. Schedule your preferred time in advance, in 2013 we were booked solid all day! Thanks to the Round Island Lighthouse Preservation Society for another great event! Round Island is an uninhabited island in Mackinac County of the U.S. state of Michigan. 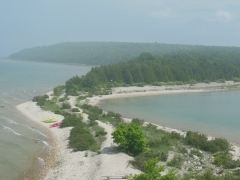 It is located in the Straits of Mackinac, which connect Lake Michigan and Lake Huron. The Native Americans called the island "Nissawinagong." Round Island is adjacent to, and helps to protect the harbor of, nearby Mackinac Island, where the estimated 900,000 tourists who visit Mackinac Island annually by ferryboat pass close by Round Island on their journeys. To Round Island's southeast lies the inhabited island of Bois Blanc. With an area of only 378 acres (153 ha), it is much smaller than it's neighboring islands. Almost the entire island comprises the Round Island Wilderness Area within the Hiawatha National Forest. The island is nominally part of the City of Mackinac Island, Michigan, but in practice it is overseen by the U.S. Forest Service. Since accessing Round Island from Mackinac Island requires crossing the straits of Mackinac, kayaking the surrounding waters is reserved for paddlers who are comfortable in larger waves and deeper waters than our other coastal tours. This is our most popular tour for our more experienced kayakers, and some even choose to camp the night in the peace and serenity of Hiawatha National Forest. Camping is allowed, and even recommended, with the mandate that extreme responsibility and appreciation be given to this unique resource; this adds to the calm and solitude that comes with an uninhabited island. The sole building on Round Island is the vintage lighthouse, Round Island Light. The shipping channel between Mackinac Island and Round Island, lighted by Round Island Light, is called Round Island Channel. In 2014, it is featured on the front cover of the "Official Pure Michigan Travel Guide" along with Great Turtle Kayak Tours guide, Eric Obscherning. Find Out More About Round Island Lighthouse..